My favorite class has been Terrestrial Navigation; it is the core class of the MTO major. The class provides the foundation for all future navigation courses. It teaches how to plot positions on charts through multiple means, as well as the basics for RADAR navigation. In the lab, we went out on the M/V Susan Clark and applied what we learned in the lectures. Everyone here is friendly, and it’s as if we are one large family. At MMA, I take part in various extracurricular activities, including Sea Scouts and Ship 1941. The Sea Scouts is a subdivision of the Boy Scouts of America and I am the Skipper of Ship 1941 of the Sea Scouts, which is chartered by Maine Maritime Academy. Sea Scouts focuses on acquiring and advancing skills related to the maritime industry. Part of how we do this, is by running Ship 1941, with faculty acting only as advisers. Our goals for Ship 1941 are to use teamwork to accomplish common goals, provide an opportunity for students to develop their leadership skills, and mentor other Ships and Boy Scout troops in the area, and to have fun. I hope to obtain my USCG Unlimited 3rd Mate’s License, and eventually make my way to a Master’s License. I plan on working for Military Sealift Command after graduation. 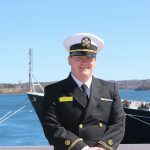 I have sailed with MSC in the past and will be sailing with them again this summer. Military Sealift Command is a fleet of civilian-crewed vessels which support U.S. Navy vessels throughout the world. MSC vessels transport infantry, resupply the military, or an act as an underway hospital. I chose MMA because I felt welcomed here as soon as I stepped foot on campus. I also know that I will be adequately trained for my career. As a student who attended another maritime academy before arriving at MMA, I would tell prospective students to choose MMA. 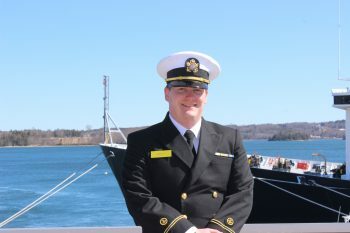 Maine Maritime has the best curriculum for training licensed majors, and you will graduate better prepared than students from other maritime academies.